The Barbizon Diaries: A Meditation on Will, Purpose, and the Value Of Stories is the second installment in the autobiographical Meditations trilogy by James Artimus Owen. I have posted about James before (3 found here) and specifically posted about the first Meditation book, Drawing Out The Dragons (right) earlier this year. The DotD post includes an audio file of a keynote address given by James based on DotD as well as a little book trailer I made for the book (view post here). Mythologies are huge, sweeping things. And the grandest stories are those with the widest arcs of triumph and despair. As much as we may want to, we may not be able to avoid the despair — but triumph is a matter of will. Drawing out the Dragons was written for everyone, but The Barbizon Diaries is an advanced course in surviving the Refiner’s fire — because some stories are too important not to share, and some stories are too meaningful to hide. 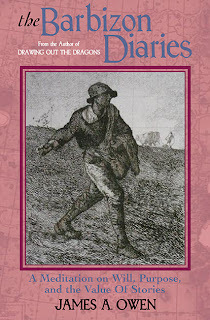 To read the prologue to The Barbizon Diaries, please click here. The Barbizon Diaries contains stunning prose, stories, and messages. I gobbled this up in the wee hours of the morning, unable to put it down. The writing moves the pace forward smoothly, is effective and efficient (you can tell the words were chosen purposefully and just so), and paints the autobiographical stories as the author intended. The Barbizon Diaries is a very uplifting and self-reflective book (for the reader, but I'm sure also for the author) in an elegant, conversational style. I was reminded that the darker parts of our lives do not diminish us, but can serve to make us greater. This book made me want to take a deep breath, and Win. James is also known for the Starchild graphic novels and the Mythworld books, as well as The Chronicles of the Imaginarium Geographica novels for youth (published through Simon & Schuster), the 6th of which, The Dragons of Winter, comes out on August 28, 2012.